Best Wedding Photographers Hilton Head, SC. At this 2013 wedding ceremony in Hilton Head, South Carolina. You never know when you arrive at any church or synagogue what the rules for using or having a wedding photographer are going to be. Sometime the rules are so tricky that when I walked into the church, the attendant approaches me and instructs me, that there is no photography during the ceremony. The best way to handle a situation like this, is by always having the proper equipment, skills, and knowledge, to achieve the best results that are unexpected. As the ceremony was going on while watching it threw the glass with the closed doors in front of me, I saw the windows there, and window, witch was kind of cool because the door acted as a frame. I carefully placed my focus on the couple, while having part of the the wood from the frame. 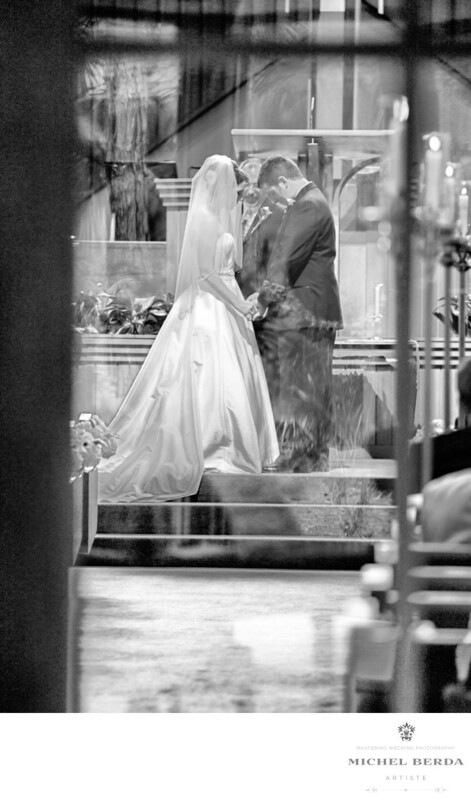 The result are priceless, your eyes flow to the couple witch are perfectly in focus, the reflection from the background play a key role in this framed image, and I love the result in black and white, it truly is a great ceremony images captured by the best wedding photographer in Hilton Head, SC.Keywords: Charleston (1179), Hilton Head (75), Wedding (90), Wedding Photographer (1254).